És la primera traducció a l’irlandès de l’obra d’Homer, segons indica el referit traductor. A FAITHFUL translation of the Iliad into any vernacular language, in metre corresponding with the original, could not fail of being interesting to the people, whose intellectual stock was improved by so valuable an acquisition to their literature. To become an adequate vehicle for conveying the thoughts of Homer, a language must be far advanced in strenght and copiousness. From such a service, however, if duly performed, it receives a reciprocal return in reflecting much of the richness and majesty of the great original. During the last few years I have been snatching some leisure intervals from weighty duties, for the purpose of connecting the Father of classic poetry with the native language and literature of Ireland. 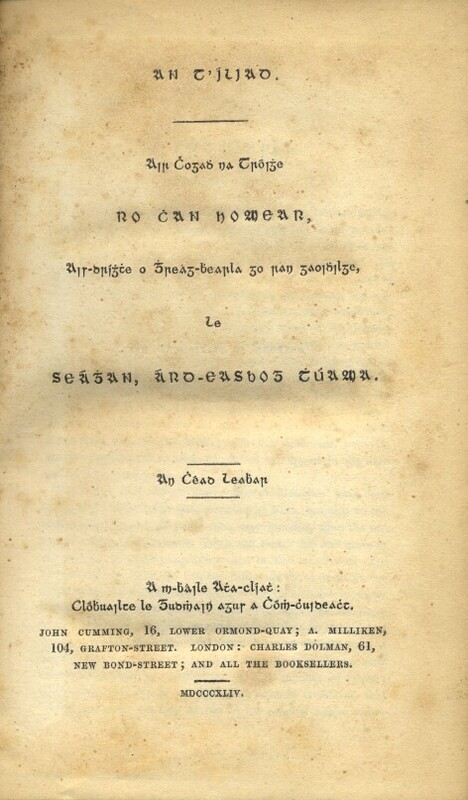 Following the same plan which I adopted with regard to the “Irish Melodies”, I purpose to publish, if not the entire, at least a large portion of the Iliad in successive books; with this difference, however, that the Greek text and Irish translation will appear in alternate and corresponding pages. The reader, who reflects that “Moore’s Melodies” have been rendered not only in the same number of lines, but also in the same precise number of poetic feet, may imagine, from the unequal number of lines in the Greek and Irish, that the sense in the original is more compressed than in the translation. On considering, however, the marked difference as to measure between modern and ancient poetry, he will be inclined to pause before he draws such a conclusion. The apparent difference resulting from the unequal number of lines is one to which a translation into any of the vernacular languages of Europe is liable. The reason is obvious. The heroic lines of the ancients in hexameter verse consisted of the average number of fifteen; those of the moderns of ten syllables; whence it follows, that the measure and meaning of two of the original might sometimes occupy three lines of the translation without paraphrase or unnecessary prolixity. If, however, to arrive at a nearer approximation in point of measure between the original and version, we were to adopt such lines as those of Chapman, one of the English translators of Homer, running into fifteen rambling feet, the spirit of the original would be entirely lost, and the tedious length would be intolerable to every ear regulated by any of the correct scales of modern poetry. Should it excite surprise that the task of rendering the Iliad in our native tongue was not undertaken at a time when it was almost universally spoken, let it be remembered that it was a proscribed dialect, and visited with the same penalties that were directed against the liberties and the religion of the people. The necessaries of life must be provided for before the introduction of foreign luxuries. Such a literary composition, requiring not only comparative leisure, but likewise those facilities which can be only be found in more propitious times and in tranquil retirement, could have been scarcely expected in the past disastrous periods of the history of our country. Notwithstanding its discouragement, the knowledge of the Irish language among the native was general, and among some it was profound. Many of our countrymen, especially the ecclesiastics, were likewise deeply versed in classical learning. But the preservation of their religion had juster and stronger claims on their zeal than the charms of literature, and the little time that remained on their hands, after the discharge of their religious duties, was profitably expended in preserving the annals of Ireland, which its enemies were incessantly labouring to destroy. Without insisting on the pre-eminence of the Celtic language beyond all others ancient and modern, or defending the learned paradox of Parsons, one of our enthusiastic antiquarians, that it was in Irish the Iliad was originally written, in which case it should be confessed that the Greek was an excellent translation; I may venture, in all seriousness, to assert, that there is no European tongue better adapted than ours to a full and perfect version of Homer. It is true, that in radical structure the Irish bears a stronger resemblance to the Hebrew than to the Greek language. But in the happy flexibility of the latter to the most varied and harmonious combinations, there is such an analogy between it and the Irish language, as to render one the fittest medium for the translation of the other. Of this easy pliancy of our language to those kindred forms of compound adjectives, in which the Greek, especially that of Homer, abounds, the remains of our ancient poetry furnish copious illustrations. Is a language, almost a wreck, long abandoned without improvement to the humbler classes of society, be distinguished by such rare excellence, we may judge of its power when it was the exclusive instrument of communication throughout the entire kingdom : nor is difficult to fancy its capability if enriched with all the treasures with which genius and industry, stimulated by the rewards of learned professions, could not fail to improve any language. Its orthography is flippantly arraigned by some who are but slightly acquainted with its principles. Beyond a legitimate variety arising from somme commutable letters, it exhibits no defects. If this be a fault, it is one that is found also in the most improved of the ancient as well as modern languages, nor has the orthography of the English language, notwithstanding its elaborate cultivation and vast dissuasion, yet acquired a fixity, which the taste or caprice of its writers cannot disturb. 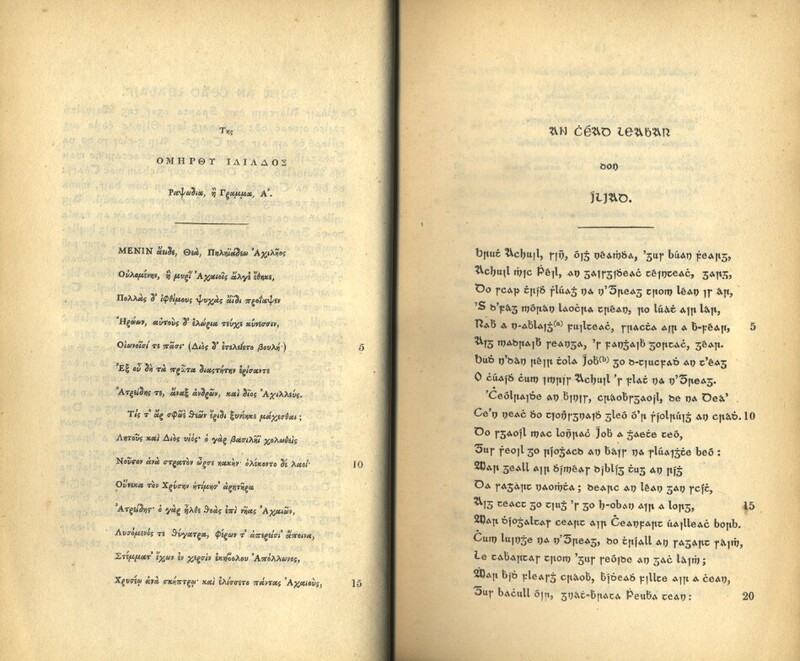 Even in its present condition, the Irish language is one of the most effective instruments of oratorical persuasion, by which the feelings of a religious and sensitive people could be roused and regulated to any pitch. Were there no other monument to attest the early and superior civilization of our nation, it is indelibly impressed on its truly philosophical language. For if, as is universally confessed, language be one of the most unequivocal standards by which you can ascertain the degree of refinement reached by any people, the sententious and expressive aphorisms that give such a complexion to ours, prove that those, to whom it is familiar even only as a spoken dialect, must necessarily be a highly intellectual people. Of what it is capable in literary composition may be inferred from this simple fact, that in the hands of an artist of no consummate skill, it has become the medium of translating fully and faithfully the choicest productions of Moore, the most refined of the modern, and of Homer, the most sublime of the ancient people. Més informació sobre Seán Mac Héil: ricorso.net i wikipedia.